There was a smallish car, in the early part of the century the X-Type, a medium-sized product, the S-Type, and finally the XJ, still with us in its third incarnation, and frankly looking a bit dated; plus a sports tourer with an XK definition. All offered derivatives, typically the X-Type with a pretty station wagon/estate car version and the limousine stretches of the XJ6. Today, it is not nearly so simple to choose a Jaguar. There are five distinct saloon models, most offering petrol and diesel versions, and a whole series of spin-offs. And there are the open and coupé versions of the F-Type, Jaguar always having a sporty two-seater in its product line-up. These days, Jaguar takes in Land Rover and behind the driving wheel of most models you might be forgiven for thinking you are in a Jag. You will find much the same control layout, including the rotary gear selector on most of the cars. For this Jaguar assessment Brands Hatch in Kent was the venue, in alternate years once the home of the British Grand Prix between 1964 and 1986. Sad to say the classic GP 2.3-mile circuit is curtailed with its use these days limited due to noise restrictions. We are left with what was once known as the Club Circuit in a natural amphitheatre and renamed “Indy”. It is a 1.2-mile track starting with the tricky Paddock Hill downhill right-hander, an uphill blast, followed by Druids, a fast hairpin. Then it's down to the left-hander named after Graham Hill, a short straight (Cooper) and into the Surtees bend, the Clark Curve and Brabham Straight where the pits are. More than 40 years ago, I was a passenger in an STOL (short take-off and landing) aircraft that put down on the straight as a test. After some discussion sense prevailed and the pilot departed solo. The display for raceday did not take place! The lap record stands at 38.02sec by Scott Mansell in a Renault Benetton from 2004. Strangely enough, the best for the Grand Prix circuit also stands to a Mansell, but not related, Nigel in a Williams Honda in 1986 at 1min 9.5sec. Both the soft-top and coupé versions of the F-Type were tried at Brands. The circuit is not ideal in terms of top speed, which is academic, or cruising, but it is ideal to learn something about the handling. You can only get an F type with a petrol engine, ranging from a 2ltr turbocharged automatic with a traditional joystick central gearbox control (£56,695) right up to a fearsome 5.0ltr supercharged model with four-wheel drive, 0-60 in 3.5sec and, says Jaguar, a top speed of 195mph (£118,320). I chose the baby (2ltr) automatic convertible version for my early laps and it proved to be plenty quick enough (0-60 in 5.4sec), with the fuel gauge indicating 33mpg. The fabric roof is acoustically enhanced with composite fabric to reduce noise and it features a flush fitting heated glass rear window. It can be raised or lowered in just 12sec and operated fully automatically at speeds of up to 30mph. This particular car was fitted with a switchable active sports exhaust, a sort of boy-racer toy. I prefer my cars to be quiet and with the roof up the engine could be hardly heard with the noise level low at the 100mph top speed I managed. You could be forgiven for thinking you were in a saloon. The fixed-head coupé was something else and felt a different car. The F-Type R Coupé is four-wheel drive and retails from £92,505; 0-60mph is said to be 3.9sec and top speed 186mph. The interior was in red leather and the lightweight seats looked and felt very good. With this automatic model, paddles mounted behind the steering wheel allow you to select gears sequentially with your fingertips without taking your hands from the wheel. Unlike the convertible, the interior luggage offering was no problem. Its load space is competitive with some well‑known family hatchbacks – up to 408ltr. For added ease of access, the tailgate on coupé models can be opened or closed at the touch of a button with the optional powered function. No head-up display as yet. A great pity. After the thrills of the two-seaters, it was back to something more mundane, an E-Pace. Why that name? Ask Jaguar. It is not a sort of derivative of the XE. This new compact SUV is based on the Land Rover Evoque with the basic car front-wheel drive, manual available, and a choice of petrol and diesel engines. The Jaguar comes with a central gear control. The E-Pace feels a completely different car from the XE which some people muddle it up with. It is styled in much the same way, the driver sitting higher off the road. While a comfortable five-seater, it is easy to distinguish from the very successful but massive F-Pace, unlike the XF and XE, which can be confused by people who are not car aficionados. It starts at a lower price too: E-Pace £28,930 v EX £31,505. When it comes to size, the E-Pace has a boot capacity of 577sq cm, is 1,649mm high and 4,411mm long. The XE comes in at 455cm, 1416mm tall and 4672mm in length. In terms of width, the SUV is just that little bit wider: 1,900mm v 1,950mm. In simple terms, the new car sits on the road 10in higher but is just as easy to get in and out. Options available on the E-Pace include a hands-free tailgate that can be controlled by waving your foot below the rear bumper, a head-up display that incorporates navigation instructions and music track information, a 12.3in fully-digital instrument panel and a couple of high-end audio systems (one offering surround sound and 15 speakers) by specialist firm Meridian. At Brands Hatch, my car was an E-Pace S petrol automatic. First stop was a short handling course around a large car park, guests expected to compete with each other, with nobody taking any risks. Then an easy-to-use parking system, before being allowed out on the open road. Looking down from a lofty perch, the lovely Kent countryside was looking superb on a sunny day. The car is smooth on roads still suffering from winter ailments. At junctions, it was easy to spot other traffic and while acceleration was not a strong suit, it really did not matter. In my maturity, my driving is more relaxed. With plenty of ‘toys’ on board, Jaguar seems to have hit the right mix and its sales reflect a strong coming to market. Compared to the F-Types, the E-Pace is measured with a 0-60 of something just under 10sec for all the 2ltr models, whether petrol or diesel, and a top speed of around 120mph. But that performance is more than adequate for the UK and perfectly satisfactory for the family/business user the car is aimed at. Whether Jaguar's claim for 50mpg can be sustained is another matter, but if it is only in the lower 40s for town and country use, it is still an economical car. 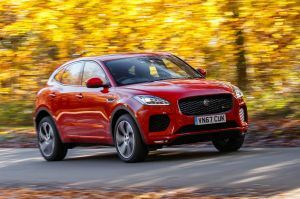 Jaguar retail sales were up 6.4% in June to 16,328 thanks to the introduction of the E-Pace, partially offset by lower sales of F-Pace and other models. Jaguar usually gets most things right. With the E-Pace, it is on to a winner.